Fantastic response to mod housewarming giveaway. Amazed by uniqueness of items found. Especially for under $200. Had no idea Allmodern had so many tasty modern treasures at decent price points. Well done. One reader exclaimed, “at that price I should just buy one”. Agreed. 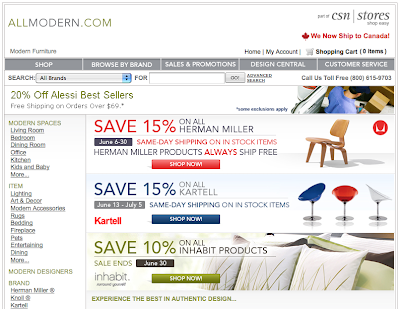 Appears 15% sale currently in action. For recap of contest in question click here. Entered all names into three spreadsheets. Blindly ran cell cursor on each spreadsheet to select three finalists. Scribed three names on note cards. Crumpled into little balls. Shuffled profusely. Shuffled again. Broke into brief juggling routine with crumples. Crawled under desk to retrieve wayward piece. Had coworker select one of three. Winner is: Jess Hanebutt. Also known as @MissJessH on Twitter. Further research revealed she runs a hip vintage clothing website for the lovely ladies. 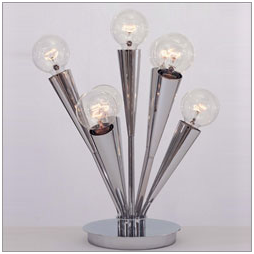 Jess picked a super sweet sputnik-style table lamp designed by George Kovacs. Price point was so low, suggested we send Jess a matching pair. Allmodern agreed. Great folks. Many comments thanked us for generosity in pay-it-forward housewarming giveaway. Least we could do to offer sincere appreciation for shared passions of mid century modern design, furniture and architecture. Thanks for reading our ramblings. Believe there may be future opportunities to host similar contests based on recent success. We shall see what unfolds. 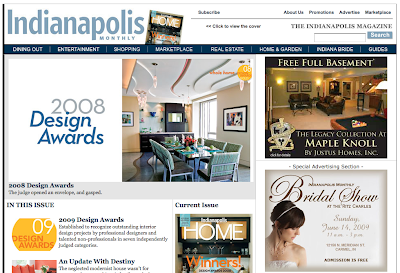 Indianapolis Monthly Magazine is in search of design talent to enter 2009 Indianapolis Monthly Home Design Awards presented by the Art Institute of Indianapolis. Pro and amateur categories exist. Deadline is Monday June 22, 2009. Know we have a few contenders amongst the A.I. readers. Get on it. Atomic Crash Party kick-off details to be released later this week. Teaser: Original architect of this rocking mid century modern home in Indianapolis will proudly be in attendance. Homeowner is a party in and of herself. True story. In the meantime, need to collect hit list. Easiest invite distribution will be through Facebook. If you're a fan and would like to be on the list, please make sure you're on the "Indianapolis Network". We will filter invites as not to tease our out-of-state MCM friends who are unlikely to attend (you can add the Indy network even if you're out of state - should you choose to view details of each event). If you're not on Facebook, no worries. Shoot us an email with "Atomic Crash Party Invite" as subject line. We'll add you to a list. 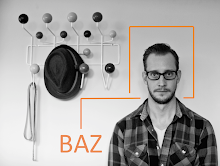 If you're a homeowner interested in hosting, shoot us an email with "Atomic Crash Party Host" as subject line. We'll start scheduling the next few months. Past weekend lead to productive renovation fun. Accumulating another monster mid century modern renovation post to feed your cravings. Plenty of work abounds. well, I'm out of state so I can't attend, but as an architecture student I would be interested in learning more about the home itself and the architect! Congrats to Jess! That is one freaking cool light.